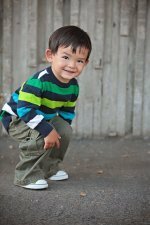 Learn how to play kickball and see why the game is so popular across all age groups. 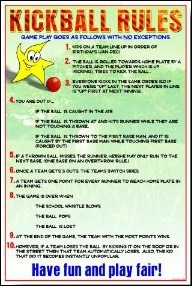 With just a few basic rules you'll be ready to start your own kickball game in no time! A kickball game is played by two teams of 9 players each who try to score more runs than their opponent by rounding the bases and crossing home plate as many times as possible. The kickball field is laid out similar to a baseball diamond with 4 bases, a pitching rubber, an infield and an outfield. All you need to play is a kickball and 4 bases. The visiting team kicks first while the home team starts out in the field. The fielders line up in one of 9 positions. The first kicker steps up to the plate to kick. The ball must roll on the ground when crossing over the plate. The pitcher has to stay behind the pitching rubber until the ball is kicked. Failure to do this results in a "ball." The strike zone is 1 foot inside and outside of home plate. The ball must be kicked with the foot or leg. All kicks must be made behind home plate. It's okay to step on home plate while kicking. No bunting is allowed (contacting the ball without fully extending the leg). A bunt is called an out. If a kicker gets 3 strikes, she is out. a pitch inside the strike zone that isn't kicked. an attempted kick that's missed. It doesn't matter whether it was inside or outside the strike zone. A kicker gets a free trip to first base after 3 balls. a pitch is outside the strike zone, and the kicker doesn't try to kick it. a pitch bounces across home plate. any fielder, including the pitcher, advances toward home plate before the ball is kicked. goes out of bounds before passing 1st or 3rd base that isn't touched by any player. A foul counts as a strike. If a player gets 3 fouls, he's out. If a player has 2 strikes and then kicks a foul ball, she's out. 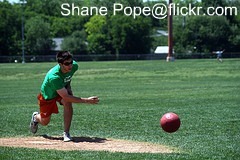 Want to learn how to play kickball if you are blind or visually impaired? 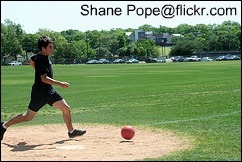 Check out Beep Kickball, an exciting new sport you probably never heard of.